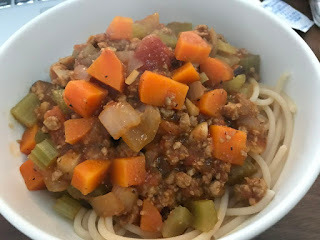 The Fragrant Harbour: Picture of the Day: Plant-based "Meat"
My spaghetti sauce using plant-based "meat"
On the weekend I tried cooking a non-meat substitute called Beyond Crumble in a spaghetti sauce. Beyond Meat was started in 2009 by Ethan Brown who questioned why we were eating meat from cows, how it was not very efficient to raise them, nor environmentally good for the planet. The plant-based "meat" in Beyond Meat is made from Canadian yellow peas, coconut oil and potato starch, and a bit of beet juice to make it look like beef. I have tried the Beyond Meat burger patty that looks like beef, sizzles like it on the stove and while it doesn't taste like beef, it doesn't have a rich feeling in your stomach. Coincidentally I have also tried Impossible Foods and the burger patty tastes of wheat, its main ingredient, which threw me off, but as shredded meat in a pancake pocket it was fantastic, and in chilli fries. So that experience inspired me to try Beyond Crumble (plant-based bits of "meat") in a spaghetti sauce. When cooking it, you're advised to cook the "meat" last, which is the opposite of what one would usually do with real beef. So I cooked the onions and garlic together, followed by celery and carrots with a bit of chopped mushrooms before adding a can of whole tomatoes and then added Beyond Crumble with chicken stock and some water. Open the bag and there are what look like cooked beef balls, that after a short time of simmering, broke down into small bits and somewhat gelled with the tomato sauce. The verdict? Again after eating spaghetti with the sauce, I was full, but didn't have that heavy feeling in my stomach. It's an interesting product, but at the same time, it's not a completely natural one either. It's something to eat once in a while, but it will never replace meat.